For those who believe Apple corners the market in elegance for technology products, take a look at a new handset released in Europe yesterday by LG Electronics -- and running Microsoft software. 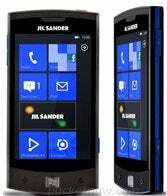 To bring some design verve to the smartphone -- which runs the latest version of Microsoft's Windows Phone 7 operating system, known as Mango -- LG gave German fashion house Jil Sander control over the look of the handset. The result is as sleek and elegant as anything produced by the masters of engaging industrial design at Apple. The black and smoke gray phone with distinctive blue sides has a 3.8-inch capacitive touch screen with a resolution of 800 by 480 pixels. Based on a Qualcomm processor running at 1GHz, the svelte mobile measures 4.8 by 2.4 inches and is a twiggy 0.4 inches thick, among the thinnest in the market. Although slightly larger than LG's Optimus 7, it's half an ounce lighter than that model. It is powered by a 1500mAh battery and offers 16GB of internal storage. The unit also has a back-facing camera for shooting five-megapixel stills and 720p HD video. The fashionable smartphone also supports DLNA, a European streaming standard; USB 2.0; BlueTooth 2.1; and WiFi; as well as HSDPA 7.2 at 900, 1900, and 2100 MHz. What's more, it contains a proximity sensor, accelerometer, digital compass, FM radio, and a 3.5-inch audio jack. For owners of the phone who want threads that match the eye-catching qualities of the mobile, the unit also has a Jil Sander app to help them find the designer's nearby stores or browse the fashion house's clothing line. Unfortunately for fashionistas stateside, the smartphone's initial roll-out will be limited to Germany, Italy, Austria, France, and the United Kingdom, where it's expected to sell for 300 Euros (about US$465.) LG is mum on when the phone will be introduced in other parts of the world. While Windows Phone 7 hasn't gained much traction in the smartphone market yet, it's been predicted by a number of analysts and commentators that the Mango version of the operating system will get mobiles using it more notice among consumers. With Mango, they say, Windows Phone 7 is truly on a par -- at least technologically speaking -- with the major players in the market, iOS and Android. Technology alone, though, isn't enough to make a dent in the smartphone market. Consumers are looking for more. Mango models with the dash and panache of LG's Jil Sander designs is offering it to them.